The mass of an atom is its atomic mass (duh!). 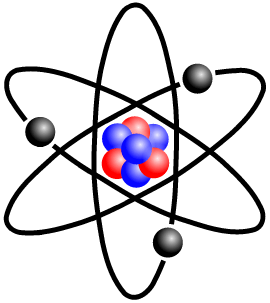 An atom is made up of protons (at least one), neutrons (except for hydrogen), and electrons (at least one), so its mass is simply the total of the masses of protons, neutrons, and electrons, right? Wrong … the nucleus of any atom (except hydrogen) is held together by the strong nuclear force, and the electrons are bound to the atom by the electromagnetic force; it takes energy to break up a nucleus, and energy to free an electron from an atom … and mass and energy are related (remember E = mc2? ); the stronger the binding, the more the mass of an atom differs from the sum of the masses of its individual components! Also, there’s atomic weight (atomic mass applies to each isotope of an element; atomic weight is an average, for each element, of the atomic masses of the isotopes … weighted by their relative abundance); relative atomic mass (a synonym for atomic weight, and also – confusingly – the small difference between standard atomic weight and the atomic weight of a particular sample! ); and … you get the idea. Atomic mass is usually measured in atomic mass units (no, no “duh!” this time, as you’ll see), which is defined as 1/12th of the mass of an isolated carbon-12 atom, at rest, in its ground state … and this is the unified atomic mass unit (symbol u), to distinguish it from the older atomic mass unit (amu). Why? Why go to all this trouble? Because there are actually two different amu’s! And both are different from u!! Both are based on oxygen (rather than carbon); one on the oxygen-16 isotope, the other on oxygen, the mixture of isotopes. More on atomic mass: from NASA Atoms, Elements, and Isotopes; The Mass Spectrometer of the Galileo Probe , and this Lawrence Berkeley National Lab webpage. Are there any Universe Today stories featuring atomic mass? Sure! Mini-Detector Could Find Life on Mars or Anthrax at the Airport, Super-Neutron Stars are Possible, and Learning to Breathe Mars Air, to give just three examples. Are there any Astronomy Cast episodes on atomic mass? Sure! Inside the Atom, and Energy Levels and Spectra, to give just two examples.